We've endured an agonising wait for the successor to the Ferrari Enzo. Drip-fed bits of information about the car over the last one year, but finally, the wait is over: the LaFerrari is here. Not quite the name that we'd expected to see - F150, F70 were some of the names thrown around on the internet, but Ferrari decided not to opt for ordinary nomenclature. The name, Ferrari says, is an expression of Ferrari's achievements, and everything else that makes this the finest Ferrari of all time. We're not sure if we like that name, but then, what's in a name? 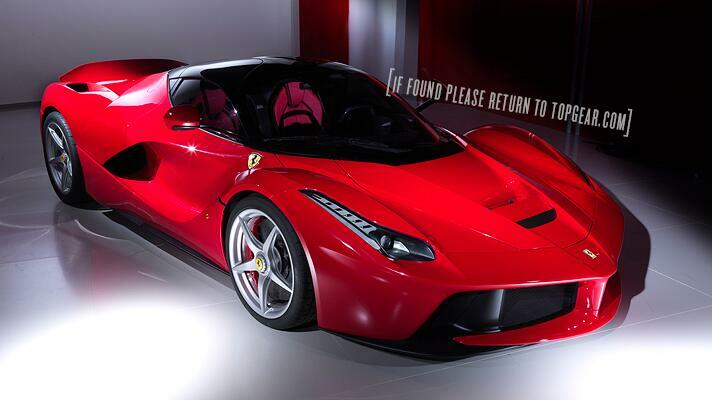 The Ferrari LaFerrari, if not the best-named Ferrari, is most definitely the fastest of them all. And not surprisingly, runs Ferrari's HY-KERS hybrid system, as we'd told you earlier. In simple terms, the LaFerrari uses two electric motors in conjunction with that great big 6,262cc V12 (also seen on the F12 Berlinetta) - which means that the LaF produces a whopping 950bhp and 900Nm of torque when harnessing power from both powerplants. The V12 on its own develops a not-so-measly 789bhp and 700Nm of torque, while the electric motors make 160bhp and 200Nm. All this power is sent to the rear wheels via a seven-speed F1 dual-clutch gearbox. Those manic figures rightly translate into equally manic performance figures, with the LaF reaching 100kph in under 3 seconds, 200 in under 7, 300 in 15 and blazing through to a top speed in excess of 350kph. Ferrari also claims that it completed a lap around Fiorano in under 1 minute, 20 seconds. That makes it about 5 seconds faster than the Enzo, and 3 seconds faster than the F12 (which, as we've seen earlier, is no slouch) around Fiorano. And that also makes it the fastest road-legal Ferrari in the history of the universe. It's not just the brute force developed by the engine that helps it achieve those numbers. Ferrari has also used active aerodynamics in the form of active spoilers, diffusers and a guiding vane underneath the car which help the car achieve a drag co-efficient of 3 (tested and honed in a Formula One wind-tunnel), making it one of the most aerodynamic road-going cars ever. The chassis is made using four different types of carbonfibre (don't ask us what types, just don't), which helps with weight distribution. The car wears Pirelli P-Zeros with 19' rims at the front, 20' at the back, which are also equipped with massive Brembo carbon-ceramic brakes that work in tandem with the hybrid system, helping the batteries charge up under heavy braking. Inside, the driver's seat is positioned just as it would be in a single-seat race car. Ferrari asked Fernando Alonso and Felipe Massa to help fine-tune the driving position, and thus, the seat position will be fixed to suit the owner, while the pedal box and the steering will remain adjustable. There will only ever be 499 LaFerraris, and you can be assured that it will be the most expensive modern-day Fezza.